Mangaluru, July 5, 2018: The well known tag for Mangalore, now Mangaluru, is ‘Rome of the East’ – it is still a large, active, enlightened Catholic Diocese of India, whose historicity is unique. We have seen that 2018 makes for 450 years (1568-2018) of the arrival of the church in Mangalore proper. In this auspicious year, Pope Francis on July 3, Tuesday appointed a new bishop to be for Mangalore Diocese. Rev Dr. Peter Paul Saldanha, the 54-year old professor of theology at the Pontifical Urban University of Rome, Italy. This was announced in Vatican by Pope Francis ceremonially at noon prayers; simultaneously Rev. Dr. Aloysius P. D’Souza announced it on July 3, 2018 at 3.30 pm at the Bishops house chapel Kodialbail and the Vatican nuncio did the same in New Delhi. Fr P P. Saldanha is the 14th Bishop of Mangaluru diocese, bifurcated with Udupi seperated in 2012. The diocese now has 124 parishes with around 2.5 lakh Catholics. 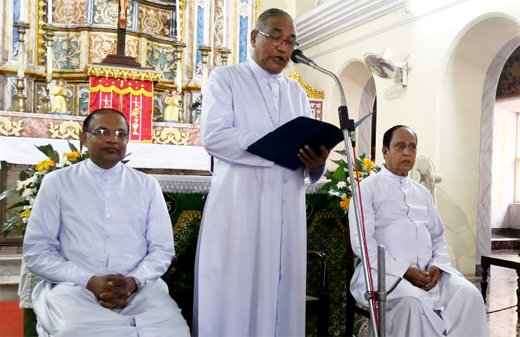 He takes over from Bishop Aloysius Paul D’Souza, who has resigned having reached the canonical retirement age of 75 two years ago. Bishop D’Souza steps down after heading the Diocese of Mangalore for 22 years, and has achieved much to say the least. 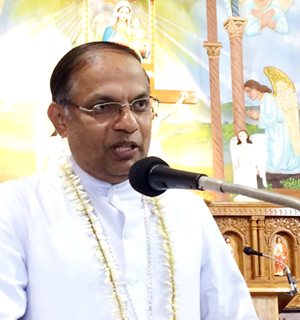 Bishop-designate Rev Dr Peter Paul Saldanha was born on April 27, 1964, in Kinnigoli, belonging to Kirem Parish (Diocese of Mangalore). He studied philosophy and theology at St. Joseph’s Interdiocesan Seminary at Jeppu, Mangalore. He obtained a doctorate in theology from the Pontifical Urban University (Rome). He also has a diploma in depth psychology and training from the Institute of Formators in Bangalore. On May 6, 1991, he was ordained a priest for the Diocese of Mangalore, by the then Bishop Rt.Rev. Basil D’Souza, with 11 others at St.Francis Xavier church, Bijai in the city. It was indeed a great day of rejoicing to the people of Kirem parish. 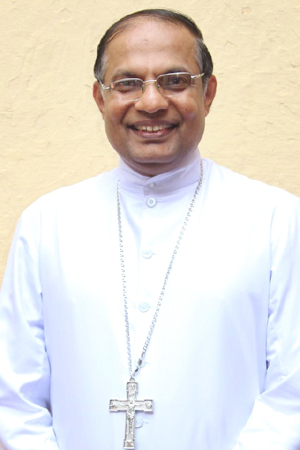 Fr Peter Paul Saldanha, hailing from Kirem parish, has been appointed the new bishop of Mangalore Diocese. Most Rev Aloysius Paul D’Souza, the Bishop of Mangalore escorted the new bishop to Kirem parish. The new bishop was welcomed with the chiming of bells. Fr Victor D’Mello, the Parish Priest (also his batch mate), welcomed the new bishop with a garland of traditional local grown Jasmines. Several parishioners were present in the church to witness this auspicious event. After the prayers, the people assembled to greet the new bishop. Thereafter, the new bishop proceeded to the cemetery and paid homage to his parents and ancestors, along with close family. In March 2015, he was appointed Consultor to the General Secretariat of the Synod of Bishops. He explained he is a permanent faculty of this faous university, with the right to serve till te rioe old age of 80 yrs. Mangalore is fortunate that on the suggestion of Pope Francis, he decided to take this appointment whole heartedly as a call from the LORD. Rev Fr. Peter Paul Saldanha has been a self effacing priest of Mangalore, held in high esteem and awe among scholars and his students in Rome and many at home. Approachable, jovial with humor to rule and unassuming, down to earth, his special quality is being a good listener ready to hear anyone with a need. A book he has authored has made waves in many a circle. Titled "The Church: Mystery of Love and Communion", the subject reveals the depth and commitment he has for the church and people. Perhaps, it is with some good reason that many people on his home turf of Mangaluru are looking forward to see him work closer to home. The Bishop designate is expected to normally take charge of his new portfolio in about 2 months. His consecration too will be simultaneous. In Mangaluru this event can be expected to be one of great significance and joy. Not only time is needed to make the many arrangements, but the new Bishop will need to examine matters and records and make him self familiar with the organisation. In this case Rev Dr. Saldanha, has been away from Mangaluru in Rome for long. The consecration, will be similar to the rite of ordination, but will be conducted by a cardinal or more than one Bishop. The venue will have to be of a prime location as thousands will be in attendance with several VVIPs present too. The newly consecrated bishop will be vested with : Miter for holiness and spirituality, Crosier for healing and guiding, Ring for fidelity and authority.